(MINNEAPOLIS) – The Mississippi River and four, 24-foot voyageur canoes are home and classroom for a group of Augsburg College students who will be in Dubuque from Sept. 28-30 as part of the nation’s first-ever River Semester. 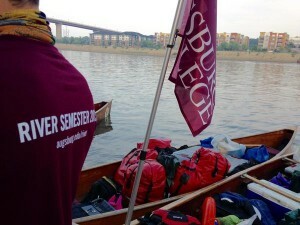 The students, who have paddled more than 250 miles of river since departing St. Paul on Sept. 1 as part of their nearly 2,350-mile journey to the Gulf of Mexico, will earn as many as 16 credits in biology, environmental studies, health and physical education, and political science. “The canoes are a floating classroom where students translate into action what they learn on shore during lectures and from their reading and homework,” said Professor Joe Underhill, creator of this hands-on learning program. The dozen students participating in this hands-on learning program, created by Underhill, is offered in partnership with Wilderness Inquiry, a nonprofit and inclusive travel provider that specializes in experiential programming and outdoor travel for people of all ages, backgrounds and abilities.